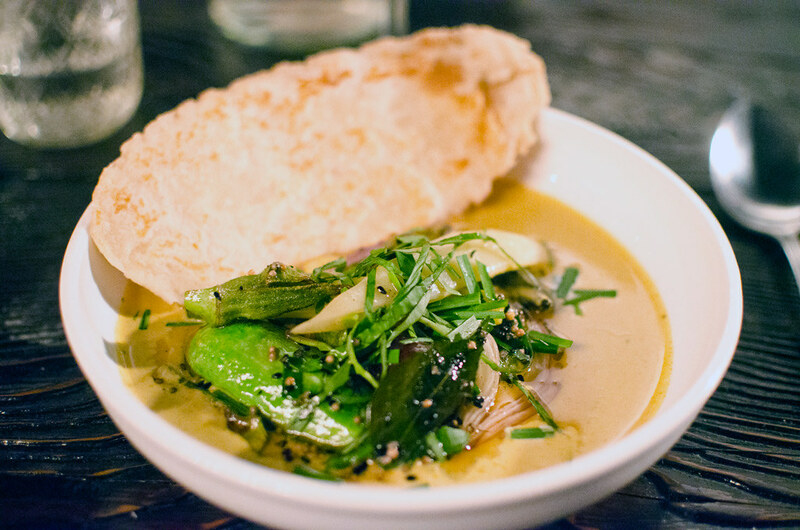 When I got notified that City Grit was having another Veggie Tales dinner, this time cooked by founder Sarah Simmons, I decided to get a couple of tickets. 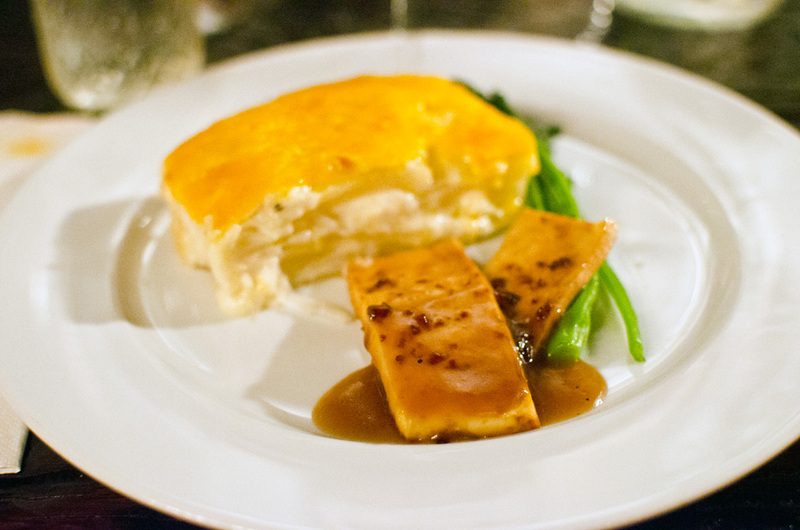 I’ve been to a vegetarian City Gritdinner before, but that dinner was created by chef Dave Santos. (Santos went on to open Louro.) Donny has gone on record as saying that Simmons makes his favorite fried chicken in the city, but I had never tasted her food. Here was an opportunity for me, as a vegetarian, to get a taste of her cooking. So along with my friend Chitra I had a long and delicious (though at times uneven) meal. The dinner started with what Simmons called the best darned veggie burger we’d ever eat, made with beets. It was a very good veggie burger, with a very rich texture and flavor. Next up was market vegetable curry, with perfectly cooked tiny little okras and eggplants. The curry itself had great flavor; my biggest problem was with the buttermilk biscuit roti served along with it. The biscuit dough was flattened and cooked on a griddle like roti, but by the time this came to the table the biscuit was cold, giving it an off-putting effect. I let it soak in the curry broth to warm it up. Next up was my favorite course, eggplant involtini. 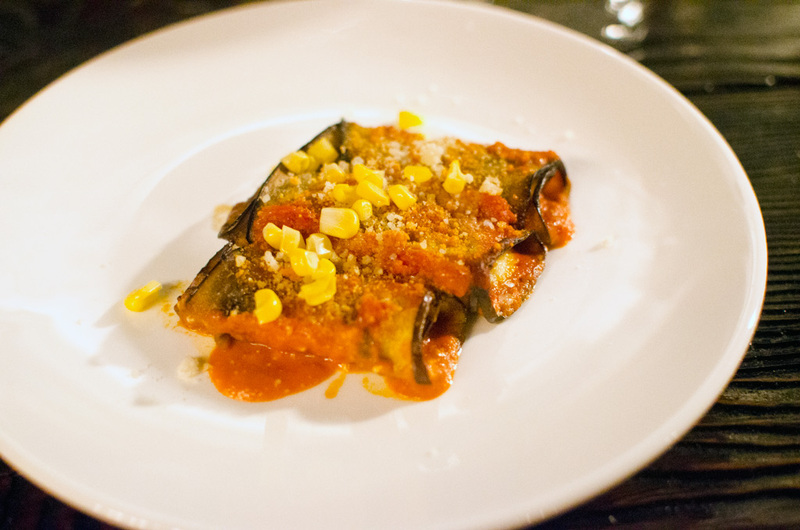 The thin sloces of eggplant were rolled around a filling of sweet cornbread, and topped with a marinara sauce. This was a great combination of sweet and savory, not to mention all of the soft and silky textures going on. Then came my least favorite course, the tofu au poivre. This was Simmons’ attempt to re-create a steak house favorite. The tofu itself had an odd flavor, and there were only two meager strips of it. The main part of the plate was taken up by an enormous wedge of an admittedly delicious potato gratin. The thin stalks of boccoli rabe seemed like an afterthought. I much prefer my own version of tofu au poivre. 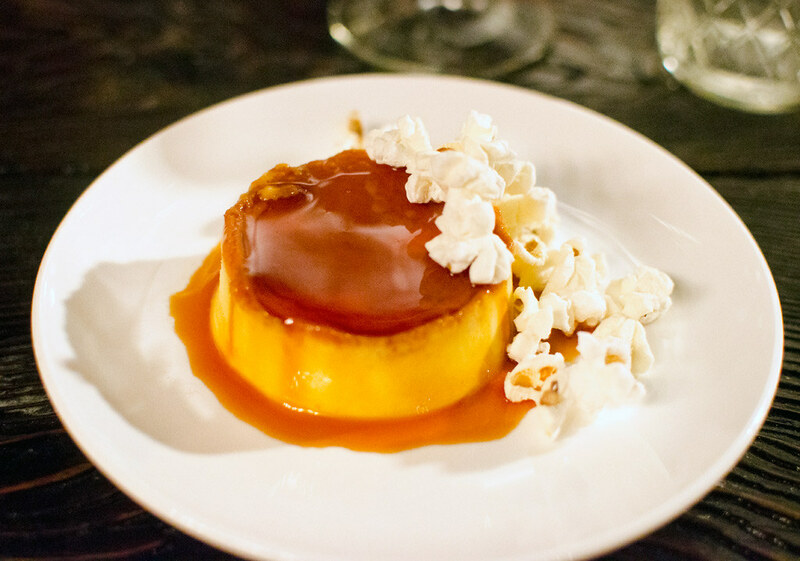 Dessert was a frozen creme caramel, topped with some fresh popcorn. Nothing fancy or special here, but it was a decadent way to end the meal. Despite its ups and downs, the meal was a good one. Dinner at City Grit is always a fun experience; you end up meeting and talking with people you’ve never met before, and there’s something fun about the large dinner format. City Grit is currently looking for a new, permanent space in which to host their dinners, and one way to help them out is to attend a dinner yourself. Click the link below to check the schedule; since every dinner is different, chances are you’re going to find something interesting.